Right Clicks the left/right/all sided skills. Clicks on scoreboard. It's just simply and usefull. You can enable scroll indicator by checking it. Writes -hhn and /squelch. Just type the playername to ignore. Shows the hp bars (in some cases doesn't work). When rosh is killed press the hotkey. Press it again to view info when he spawn. Double presses F1 to take camera to ur hero. 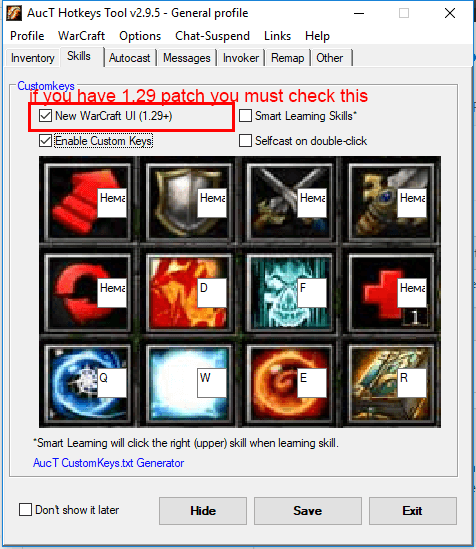 In order AHT to work properly, if you are using Warcraft III 1.2.9 patch you should check "New WarCraft UI (1.29+)". Don't forget to click save for the tool to apply your setting. 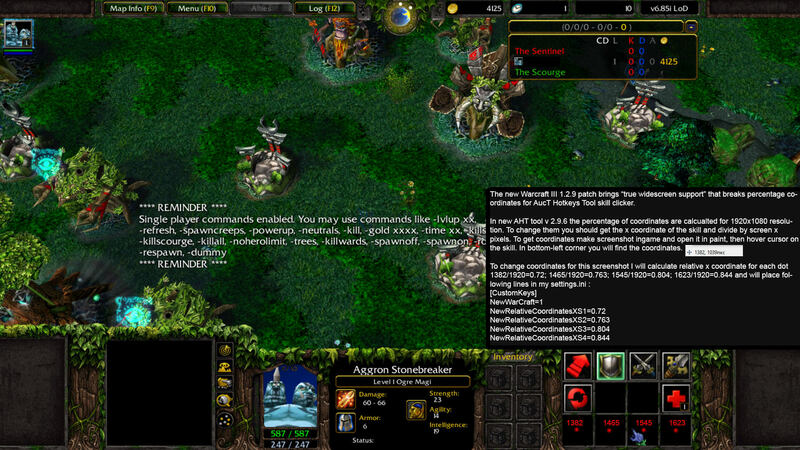 The new Warcraft III 1.2.9 patch brings "true widescreen support" that breaks percentage coordinates for AucT Hotkeys Tool skill clicker. If your screen resolution is 1920x1080 or you don't use skills clicker you are fine and should skip the rest of the tutorial. But if you have other resolution you need more work to do. Read the following guide for coordinate correction. In new AHT v 2.9.6 the percentage of coordinates are calcualted for 1920x1080 resolution. If you have other resolution or AHT miss the skill position you need to change coordinates in config.ini. To change them you should get the x coordinate of the skill and divide by screen x pixels. To get coordinates make screenshot ingame and open it in paint, then hover cursor on the skill. In bottom-left corner you will find the coordinates. © 2012 AucT Hotkeys Tool All Rights Reserved. Design by AucT.